They Just Rang A Bell On Gold-The Lows Are In! As they say on Wall Street, “They don’t ring bells at the top” and for sure they usually don’t give you a phone call at the bottom either. Many heads have rolled trying to call this recent near 2 year downdraft in Gold in terms of bottom callers, me included. I thought we would never get much below 1440 or so from the 1923 highs, but alas we all know we did. 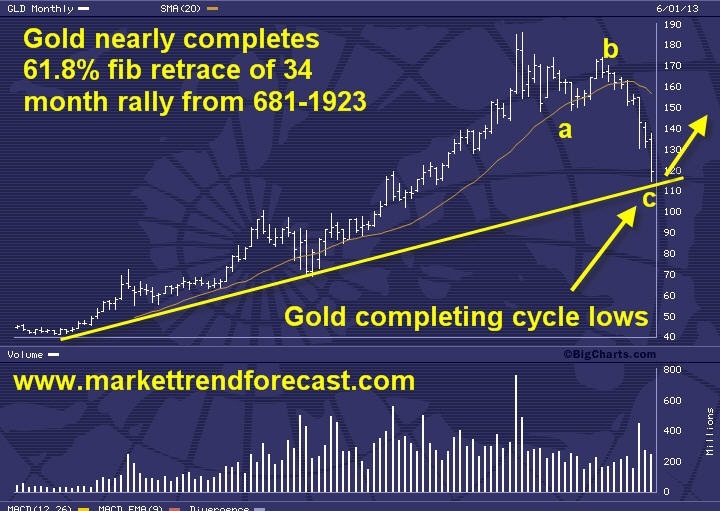 What makes me think that last week put in the final Gold low for the bear cycle? Too many things to mention, but based on the work I do enough to give me some chutzpah to make this call now. The 1180’s are very close to a classic ABC 61.8% Fibonacci retracement of the prior 34 month bull cycle. That cycle ran from October 2008 to August 2011 with a rally from $681 to $1900’s area. The most recent 21 plus month decline dropped right into the 61% pivot retracement of that entire move, and over a Fibonacci 21 month period as well! Human behavior does repeat over and over again, and as we all know in hindsight at the tops everyone is bullish and at the bottoms everyone is bearish. I think it’s pretty much as simple as that. Investors get overly optimistic and exuberant in all kinds of asset classes and finally at the highs everyone believes the rally can only go on and on forever. At the opposite near the bottoms nearly everyone is calling for lower prices and further catastrophe ahead. Stocks in the sector are priced for near bankruptcy. Newsletter writers are universally bearish, and the small trader has a big short position. Only a few weeks ago the Bullish Percentile index measurement on the Gold Stock Index was at 0! That means nobody was bullish on the Gold stocks by the measure that is used. We quickly had an 8% rally in the index after that reading, then in the last few weeks we came all the way back down again to even lower levels! If you watched the action last Thursday as Gold was melting down below $1200 a curious thing happened. The gold miners were ignoring the move and going green! On Friday, as Gold reversed to 1234 they went ballistic with one of my favorite miners going up 16% on Friday alone on the highest volume in 5 years! Those are the signals I’ve been waiting for to call the capitulation lows. My guess is some money managers are front running the coming 3rd quarter rotation they see in Gold and Gold Miners, Copper, Coal, and other commodity stocks. So below is my basic GLD ETF multiyear chart using very simple monthly views to see the big picture. You can see a classic ABC pattern of bear market correction and now a near 61.8% perfect Fibonacci retracement of the prior leg up. I’d say enough is enough, pick your spots and start buying.